Some people like to collect things. People collect stamps, antiques, shells. You name it, and there’s probably a group of collectors out there busily collecting it. And not just material things either, some people collect things like visits to all the major cities of the world, or railway journeys. Mountaineering has its fair share of collectors. Some of these fall into the loose category of 'Peak Baggers' although there are also the 'First Ascenders' and 'Fastest Ascenders' as well as many others. Peak Baggers collect summits, whether it's all summits over a certain height in a particular country, all mountain summits over 8,000m in the world, or the highest summit on each continent; known as the 'Seven Summits' quest. Personally, I've never been interested in collecting summits, although I've inadvertently collected quite a few in my travels to explore somewhere new. I recently stood on the highest summit in Germany, although I only discovered that fact, when I was actually up there. I've enjoyed the view from the highest point in Africa, the three highest points in England, Scotland, and Wales, and also marvelled at the view from many of the highest spots in the UAE, Oman, India and Nepal, but it was only after about 25 years of living in the UAE that I actually stood on the UAE's highest summit. Ironically, it was the peak-bagging brigade that set me off to climb to the top of Jebel Yibir. For years I'd believed that Jebel Bil'ays, at 1934m, was the highest point in the UAE. It wasn't until I started getting inquiries via my web-site from some peak baggers, that I realised my mistake. Jebel Bil'ays is on the border between the UAE and Oman, which probably makes the summit technically in Oman. I've climbed to the summit of Bil'Ays a few times, and each climb was from the Omani side. A quick bit of research on the Internet indeed confirms that Jebel Yibir is top dog in the UAE at 1527m (5010ft). (Jebel Hafeet is 1240m, and Jebel Hatta is 1311m, in case you were wondering). After finding out about Yibir's status and not finding all that much information available on the Internet, my curiosity was aroused, and I dragged out the maps, in order to find out whether it would be worth a visit. The lack of available information, and the tantalising topography displayed on the maps, meant that I just had to go and take a look. The whole episode has been fun, from start to finish. Not only was the route to the mountain up a wadi that I thought I'd never explored before, but the route to the camp-site looked very exciting. Actually I've recently discovered that I had in fact explored this wadi many years ago in the days before GPS, and I'd never been able to remember how to find my way back to it! Also, many years ago, I took a wild helicopter trip from Ras Al Khaimah airport, during which I snapped a few aerial shots of the mountains. Recently, completely by chance, I looked through those old photos, and recognised that a couple of them were actually of Jebel Yibir. That flight was nearly 20 previous! Given the above coincidences, it should come as no surprise that my first visit to Yibir was on my birthday! I remember remarking that I couldn't have wished for a better birthday present. My birthday is at the end of December so the weather on that occasion was pleasantly cool. We didn't actually climb to the summit that day, but we did see enough to find a possible route for the future. I remember we had a few spots of rain, and it was so cold in the strong damp wind that we had to walk in our waterproof jackets. It wasn't long before I was back again, with my old friend Robin, and making a serious attempt to reach the summit. It was a hard day's climb, and Chirri cut one of his pads which needed numerous changes of bandage as he wore them out on the rough rock. The route finding was challenging, and there was so much to see on the way that the eight hour round trip didn't seem so arduous. There had been recent rains resulting in carpets of mountain flowers and plants, which made the tracks more difficult as we tried to avoid stepping on them. approx 1300 mts above sea level. Climb takes approx. 4hrs up 3hr down with stops. Typical climb: Left at 8am summited at 12:05 left summit at 12:40 down at 15:55 via first summit. 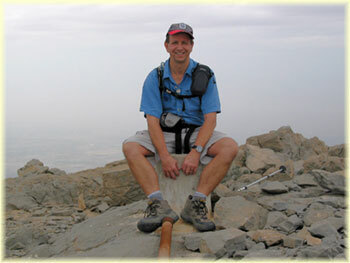 Top of Jebel Yibir (25° 38.5992N – 56° 7.9476E Alt- 1,527m) which has a concrete trig point. Looking NNE from the campsite (camp 65 - see maps) you can see three summits; the right-hand, domed one is Jebel Yibir. In the foreground you will see a road snaking steeply up the foothills. The route starts up the road and you should park your vehicle at the bottom because due to erosion you can’t drive up it (actually you can now it has been re-built). Look out for a white building on the slopes in front of the Jebel; you will pass this on the hiking route. Note that the white building is on the right side of a deep wadi, not clearly visible from the camp. You will cross this. Follow the road to N25 37.503 E56 07.456, then, descend into a deep wadi to the right. Ascend on the opposite bank up an easy-sloped gully to escape from the wadi, and leave this gully to the right. Continue up until you reach a walled enclosure. This is a good place for a rest! The walled enclosure has a level dried mud 'field' inside with a partitioned area to one side. You should have been able to see this enclosure from the point where you left the road, as well as the white hut. From the walled enclosure, you cross the top of the u-shaped wadi to a small knoll. Keep this to your left and contour up and around it. You should see more walls to your right and in a few minutes reach a pair of water cisterns with man-made channels running into them. Continue up the slopes behind the cisterns and within a few minutes reach a substantial farm with some modern and traditional buildings, and enclosed fields. Look up the ridge behind this farm and locate some more rock walls. Make your way up to the walls and reach a larger farm, also with modern and traditional buildings. There are some rock drawings here. From this second farm, look up again towards the peaks, you should see a summit directly ahead of you, let's call this ‘summit one’. The actual summit of Yibir is behind this a short distance, but you can use this nearest peak for navigation. Notice that there are several wadis coming down towards you from the mountains above. You need to visualise a route that will lead you to the right flank of ‘summit one’ without having to cross any deep wadis. You will then circle round this summit keeping it to the left. You must aim to get onto the ridge coming towards you which leads directly to the right flank of ‘summit one’. The route starts up the right side of a wadi that goes up from the far left hand corner of the fenced field enclosure. It then angles slightly right on a faint track, which crosses one shallow wadi at a cairn, and then another shallow wadi beyond. It then circles ‘summit one’ round to the back of it. It's a good idea to waypoint the key features on the way up to help in finding the way down again. Once you have the route fixed in your mind. Make your way round the left of the fenced field keeping the fence on your right. Once you reach the far left hand corner of the field, you should embark on the route you have visualised by starting upwards with a shallow wadi to your left. Cross the two shallow wadis mentioned above and circle round to the back of ‘summit one’. Now you should see another summit with a cairn on top of it; this is ‘summit two’. The summit of Jebel Yibir is the less attractive domed peak to the right on the opposite side of the valley. There is a substantial communications station on the western shoulder of Jebel Yibir and just a little lower than the summit itself so there should be no confusion. You may want to climb ‘summit two’ first. There are a couple of cairns, an oxygen cylinder and some hydraulic hoses up there, but more importantly a wonderful view. You'll be able to make out the easiest route from there to the top of Jebel Yibir (25° 38.5992N – 56° 7.9476E Alt- 1,503m) which has a concrete trig point, some steel pipes, and fine views of Jebel Qihwi to the north-east; recognised by a communications mast on its flank. On the way down you can go via the right flank of ‘summit one’, although it probably isn’t any quicker. Take it easy because the surface is steep with loose stones making it easy to lose your footing. Just in case you forgot, you’ll have to cross that deep wadi again!! Or you can wimp out and walk down the road. Have fun. Maps to help you find the way.